I love all things beachy. It is my most favorite decor theme! 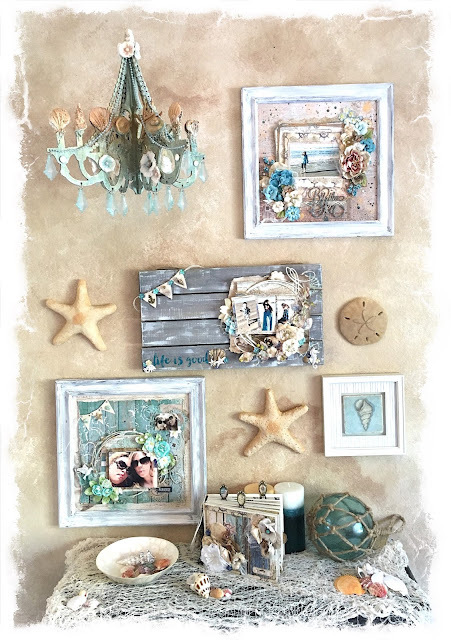 Besides the chandelier, I also made each project, mostly using Prima products, which I have already shared in previous blog posts. So, for this chandelier, my main idea was to replace the "lights" with shells, and give it a bluish patina wash. Here's a couple of different pictures of the whole project. I started out painting the chandelier with some VerDay paint, and then I added some gold crackle in random spots. I then dry brushed the entire thing with white gesso, then I gave it a good spraying session with the color bloom sprays in deep teal, light teal, and glistening waves. I also added some pearl strands from my stash, and well as some Prima Calcutta flowers I have been saving for a special project. Lastly, I added the Prima chandelier adornments. They were clear, but I decided to give them a beach glass finish, again using the blue color bloom sprays. Thanks for checking out my entry for the Prima Wall Art contest! Gorgeous!! Did you have to prime with anything before spraying color bloom on the crystals for your beach glass effect? imo beta I will definitely bookmark your blog imo for pc I would like to say that this blog really convinced me to do it! Thanks, very good post.